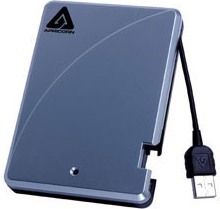 The leading provider of personal storage products, Apricorn has announced its new Aegis Vault line of portable USB hard drives that available in 80GB, 120GB, 160GB and 250GB sizes and priced around $140 to $270 respectively. The latest Aegis Vault can secure your datas thanks to the AES-128 bit hardware encryption with password protection, which can be configured into multiple partitions for public data sharing and features an administrator password option for corporate applications to make sure the secrets can only accessible with a password even if the hard drive is removed from its enclosure. In addition, the 2.5-inch portable drives which sports an integrated USB cable also includes a robust 16-point omni-directional shock mounting to prevent an accidental damage.